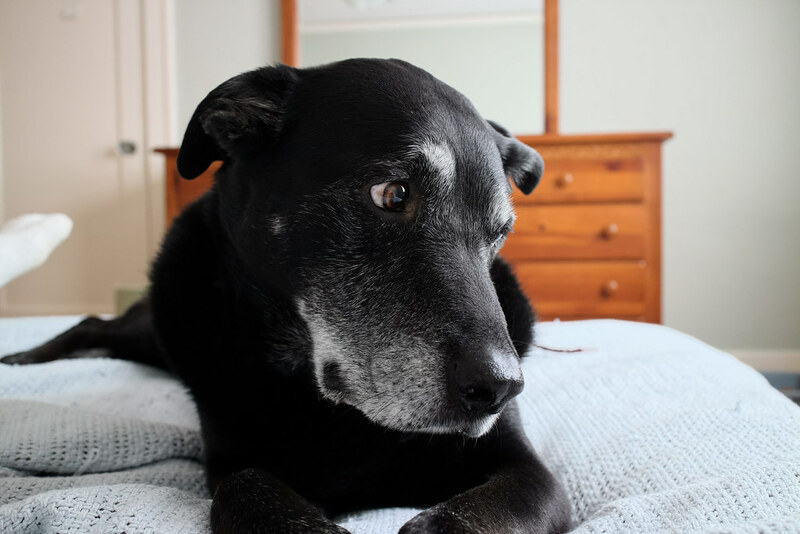 When we adopted Trixie early last year, we kept her in isolation at first, both so she could have time to build up her confidence in her new home and to give the other pets a chance to adapt to her arrival. Ellie hated being kept on the other side of the door while I sat with Trixie so it was a big relief for everyone when Trixie and Ellie hit it off early in the process. It was soon clear that I could trust Ellie with the increasingly active kitten, even if I were to leave the room, with one expected exception: Trixie’s food. I was delighted to catch Ellie looking wistfully at Trixie’s bowl of cat food just off camera. I knew from past experience that if I were to walk out of the room, Ellie would wait until the moment I was out of sight and then jump down and devour any and all food in the vicinity. It was a struggle to get Trixie to eat so we left her food out all the time, but I’d pick it up if I needed to leave the room for a moment or when we went to bed at night. But otherwise she was, as she always is, the perfect companion. 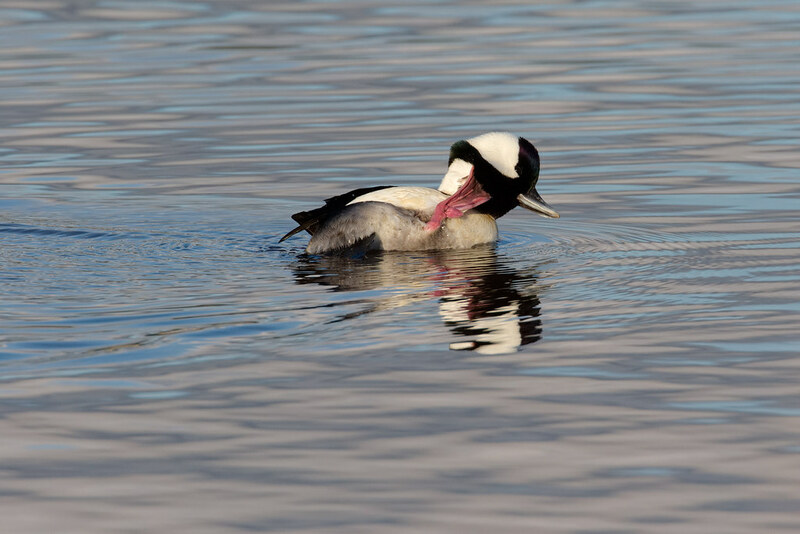 Visit Ridgefield in the winter and you’ll see waterfowl diving under the water to feed, such as this bufflehead at sunset above, or the coot below, its red eye visible just above the water. 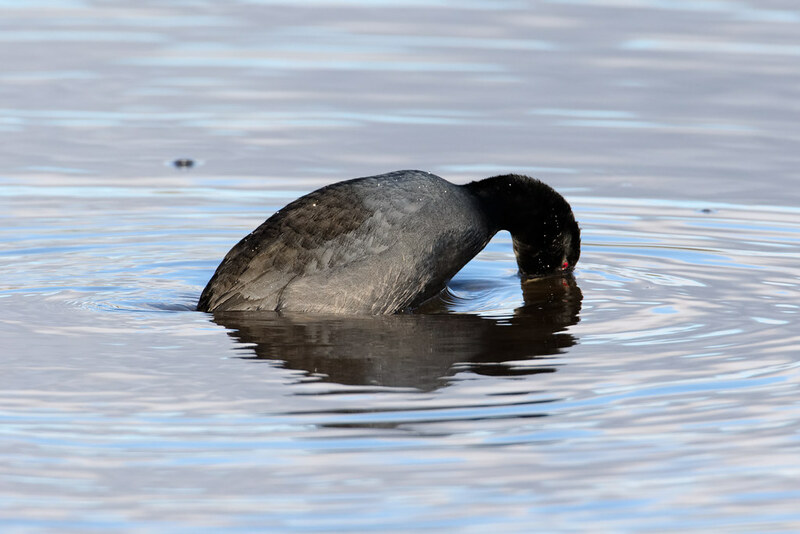 I like to sit and watch them and have been struck by the many differences in the bodies of coots and diving ducks, even though they both spend much of their lives diving underwater to feed. There are differences in their bills, and their feet (ducks having fully-webbed feet, coots not), but my favorite difference is most visible when they dive. 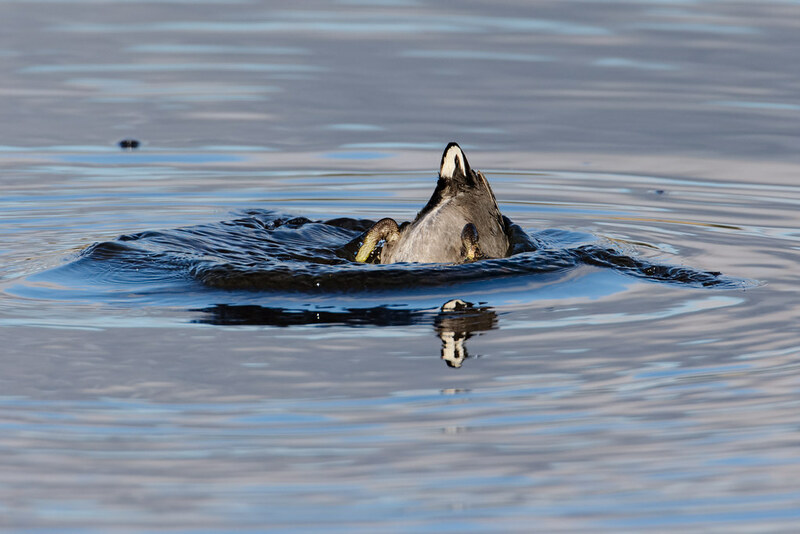 Both diving ducks and coots spring forward and break the surface tension of the water with their beaks, but ducks leave a vortex behind them at the start of the dive while coots do not, a difference that begins with their ends. 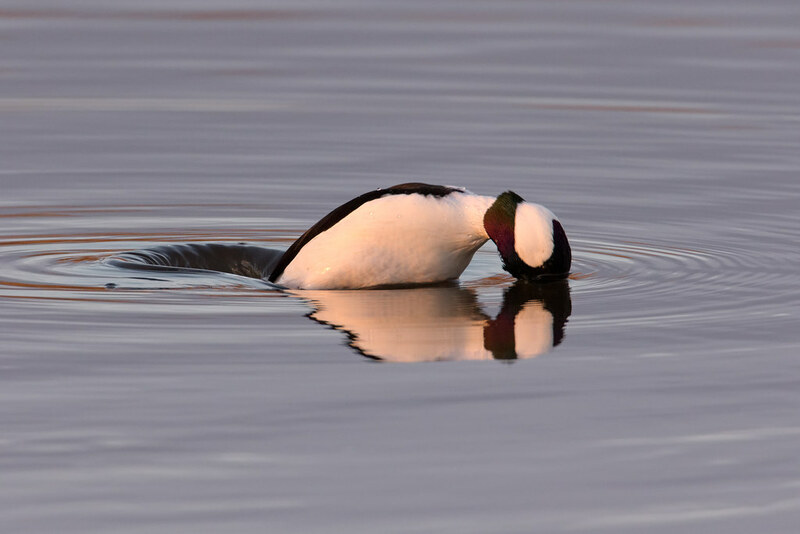 Diving ducks like the bufflehead have broad tails that they spread out horizontally on the water before they dive, enabling them to push their tails down and themselves forward as they start their dive. 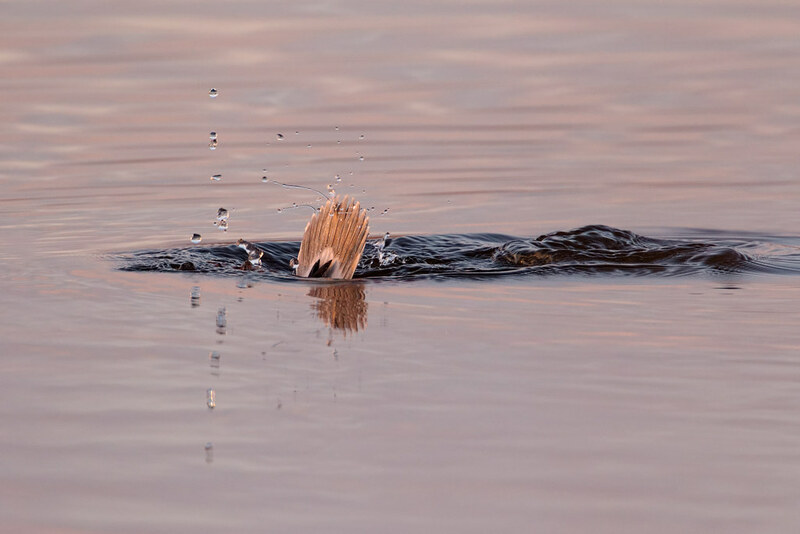 You can see the pattern of their tail feathers, shown below as water flips off the bufflehead’s tail as he finishes the dive, in the water behind the duck in the first picture. Compare the bufflehead’s tail above to the coot’s below and you’ll see the coot has a stubby little tail and can’t use it to push forward like the diving ducks can. While it might seem that the diving ducks have solved the diving problem much more efficiently than the coots, I should point out that the coots at Ridgefield far outnumber any species of diving duck at the refuge. A trait they share in common is that they have to get a long run across the water to take to the air, so if a bald eagle attacks, they prefer to dive under the water as a means of escape. It’s usually effective, but sometimes you’ll see an eagle keep flying over a duck or coot repeatedly until its prey tires and surfaces at just the wrong moment and is captured in the eagle’s talons. I’ve seen eagles with a variety of waterfowl in their talons, but coots more than any others, not surprising given their large numbers. 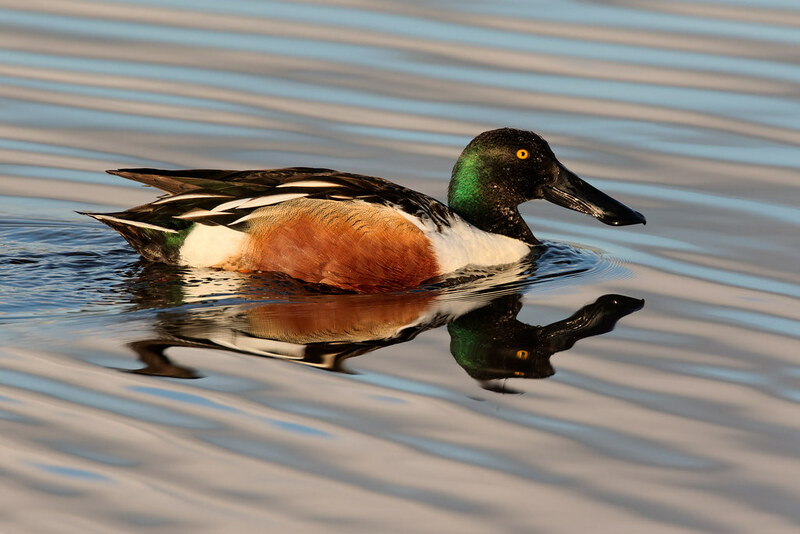 After circle feeding with a female for much of the afternoon, this male northern shoveler swam near my car at the end of the day, minutes before I left to make sure I was off the refuge before the gate closed. I hate leaving when the light and the subject are so beautiful. 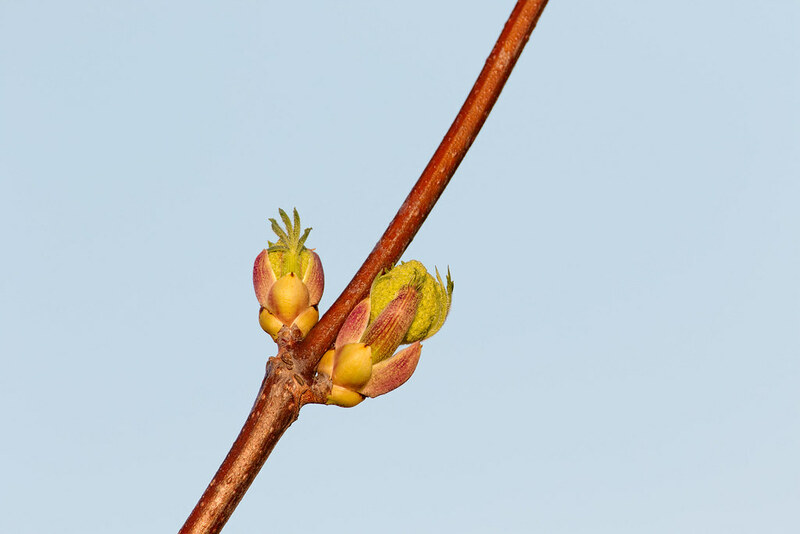 A small green hand reaches out from a tree bud as a dormant life awakens. Taken late on a winter afternoon, a reminder: spring is coming. 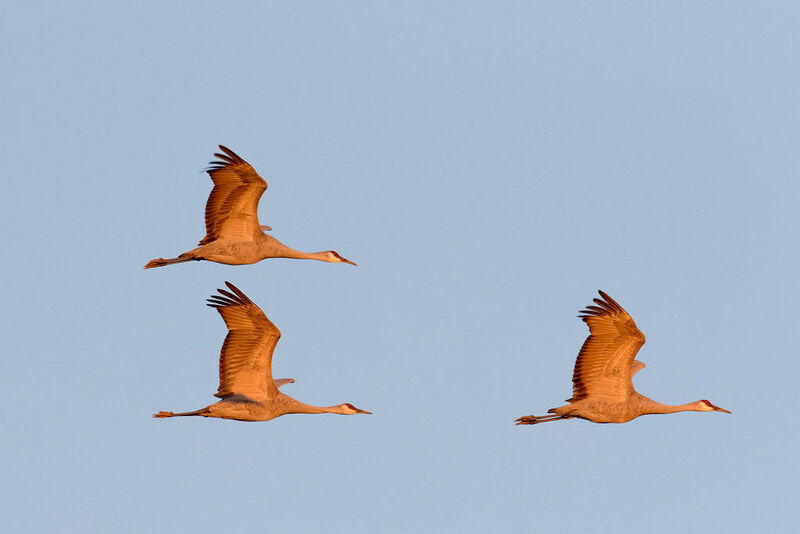 Three sandhill cranes, part of a much larger flock, fly in formation over Rest Lake at the end of a cold winter’s day. The skies above Ridgefield can be noisy in the winter, usually from the large flocks of cackling geese and tundra swans that overwinter at the refuge, but particularly early or late in the day sandhills may join the chorus. 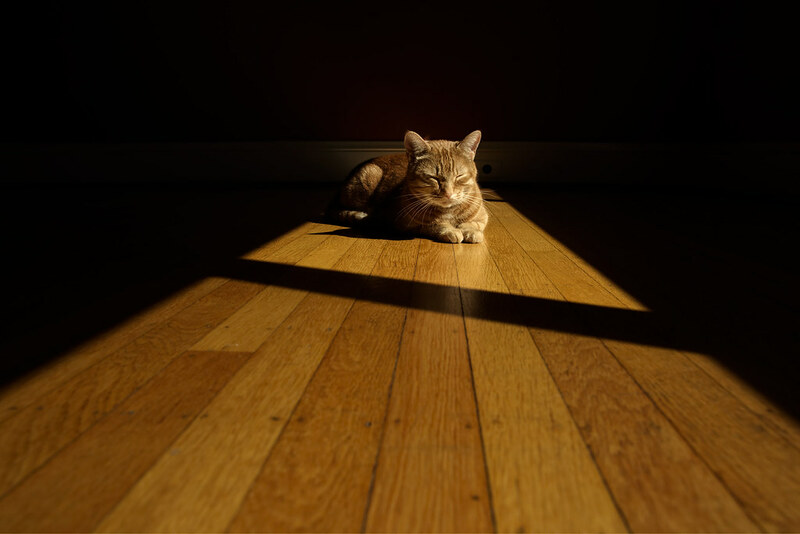 I was walking past the dining room when I saw Sam sleeping in an unusual spot, perfectly framed on the hardwood floor by the sunlight poring through the large picture windows on a warm spring morning. I ran to my office and grabbed my camera and got the lovely picture below, one of my favorite cat pictures ever. 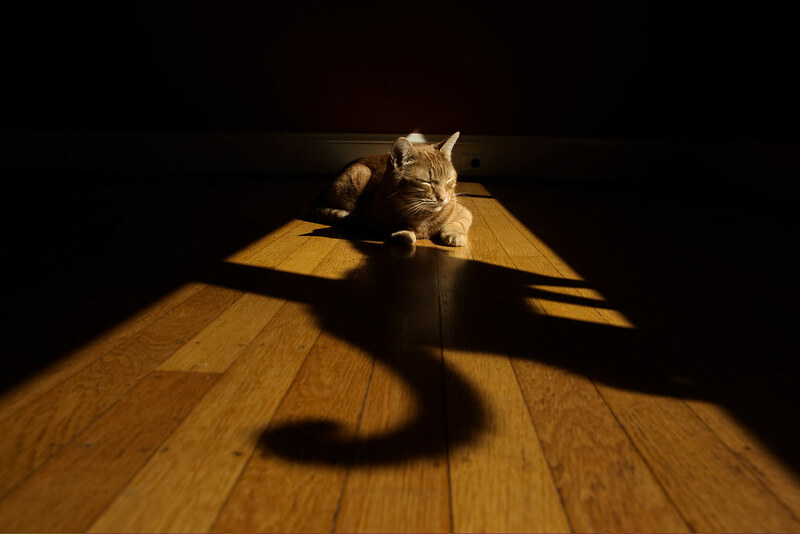 But then Trixie came in after me and jumped up onto the window ledge, her shadow so perfectly positioned that her head is next to his and her tail curls back towards me, as though his shadow had come to life and turned around to greet him. Thankfully I got the picture above as the moment didn’t last long. I like both pictures but the top one illustrates much of their relationship in an abstract form, Sam relentlessly pursued by his younger sister who adores him. I couldn’t have posed them any better as more than anything she loves to cuddle up face to face, which he’ll often tolerate when he’s sleeping on my legs. Sam decided he was getting a little too much attention, between the clacking of my SLR’s shutter and the newly arrived Trixie in the window, so he got up and we all retreated to my office.